We are an authorized dealer for "Garant Mobel" modern and contemporary furniture pieces . 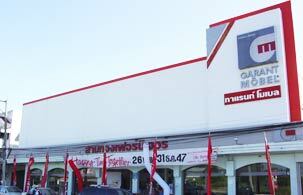 Visit our showrooms at Samkong and Bypass for experience our elegance furniture. Our showrooms feature plenty of European life style furniture with Good Price and High Quality. In our showrooms, Samkong Furniture and Forum Design Furniture you will find a wide range of furniture: desks, chairs, storage, filing cabinets, beds, sofas any furniture for your office and your home. Our policy is giving the best to customers like our slogan "Garant for Better living". All of our furniture is high quality, good price and good design. We have installation service within Phuket.